Tulle-y Denim ← You Want Me To Wear What? 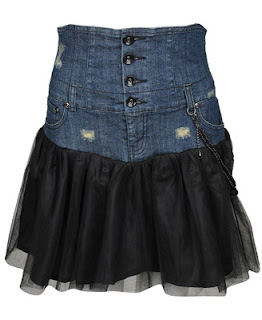 Back in the early days of the blog, I posted about Forever 21′s denim-fabric hybrid skirts. At the time, I said that these skirts would only be necessary if you were torn between wearing your denim mini or a ruffled skirt, and you decided to split the difference. Apparently, there were enough people out there who had that problem, because Forever 21 has not only made another style of it, but this time, it’s formal wear. See, you know it’s formal because it’s kind of a dark denim and the rips aren’t big enough to show skin. Plus, the black tulle hem looks like it was lopped off an actual dress and stitched onto this monstrosity as a warning to other dresses. I’m having a hard time seeing where the demand for this style of skirt is coming from, but then again, I also don’t understand who keeps buying the high-waist button placket styles, either. Have we learned nothing, as a society, from the missteps of the celebrities who wore high-waisted denim and were subsequently ridiculed for it? Why do people keep buying this style? I can’t imagine it’s that flattering on so much of the population. And if it’s not selling, then why do the designers keep making it? I will say, one thing I do like about this skirt is the attached beaded chain. Because that beaded chain really pulls the look together. 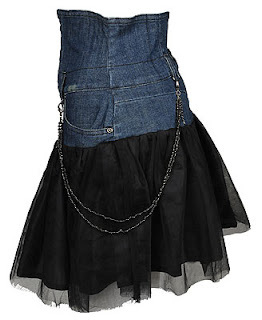 No, seriously, who on the design team said, “What this high-waisted, ripped denim skirt with a tulle hem needs is a jeweled chain?” Because they were 100% correct. The chain is removable, but really, why would you?